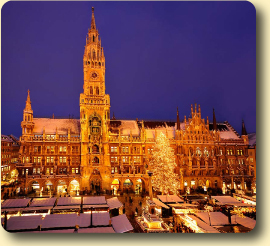 Munich's Christmas Market - whose roots go back to the 14th century - is held on the Marienplatz in the heart of the city centre. Town records first mention a ”Nicholas Market” in the Kaufinger Strasse near the Frauenkirche (Church of our Lady) in 1642. Back then, just like today, the Munich Christmas Market offers traditional Bavarian and unique Christmas gifts, including wood carvings from Oberammergau, gingerbread (Lebkuchen) from Nuremberg and notably some exquisite glassware from the Bavarian Forest. Crib figurines, bee wax candles, chimney sweeps made of plums and almonds are just some of the many thousands of other traditional Christmas gift ideas on display. Each day, from the balcony of Munich’s town hall, music lovers will be able to enjoy the festive season celebration with a special alpine Christmas Market concert. In the Town Hall‘s ”Heavenly Workshop”, children between the ages of 6 and 12 can have fun with arts and crafts or baking Christmas cookies. Gossamer wings and shimmering gowns lie ready in magnificent surroundings, waiting to transform young visitors into angels – at least for a short while. Under the supervision of professional artists and instructors from the city‘s Children‘s Museum, girls and boys can have a good time. And it‘s free! The equally popular Kripperlmarkt, one of the largest in Germany to specialise in cribs and other nativity accessories, is a short walk away on on Neuhauser Strasse. 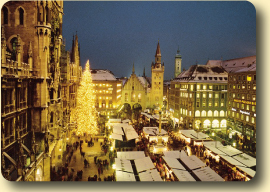 The historical event has been part of Munich‘s traditional Christmas Markets since the middle of the 18th century. The Kripperlmarkt has all you need to create an authentic manger. Each lovingly chosen and carefully packed item, being a reminder of childhood, when the manger under the Christmas tree symbolized a world of mystery and wonder. 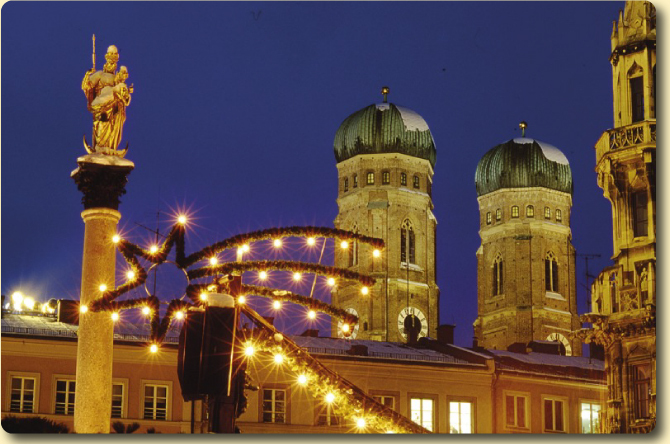 Christmas mangers, cribs and nativity scenes have long been a tradition in Munich. As early as 1597, the Jesuits set up a manger in St Michael’s church. 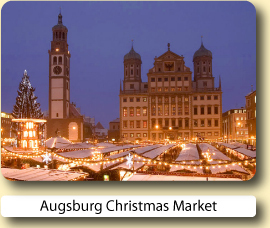 In 1757, the first original Kripperlmarkt Christmas market took place: it lasted from the 1st day of Advent to Epiphany. More than a Christmas Market and totally different is the Tollwood Christmas Market, Munich´s fantastic ethnic festival. On the Theresienwiese you will find a spectacle of tents offering an exciting mix of international musicians and drama groups, performances, live music, art and culture as well as popular Christmas Market ideas with handicrafts and cuisine from all over the world. In all there are a further 20 Christmas Markets located throughout the city of Munich, including a Medieval Christmas Market with gospel singing at the Wittelsbacher Platz, a gay pink Christmas Market (Stephansplatz) and if you have forgotten anything before leaving for home there is even a Christmas Market with ice skating facilities at Munich’s international airport. 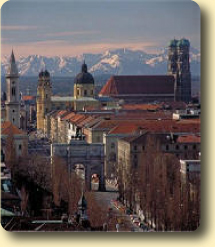 Munich nestles between art and beer like a village between hills. Originally written by Heinrich Heine some 150 years ago, these words remain true today. With the oktoberfest and opera, Hofbräuhaus beer hall and the Pinakothek art galleries, BMW and Bayern Munich, the city manages to marry old Bavarian traditions with vibrant modern life. The Bavarian capital has so many fantastic attractions that it's hard to know where to start. So the most important thing to take on a trip to Munich is plenty of time. A car collection point and themed attraction unlike any other in the world, BMW Welt brings this prestigious brand to life. With a prime location close to the BMW corporate headquarters, museum and factory, BMW Welt is not just for car buffs and lovers of all things technical. It also offers a wide range of activities and regular special exhibitions, combining engineering, design and innovation with lifestyle, enterprise and culture, in a stunning, state-of-the-art building. At the viktualienmarkt visitors will find a whole host of stalls selling spices, game, fish, local and exotic fruit, flowers and plants, and much more. And it all looks as good as it tastes. Viktualienmarkt is also home to the city's most central beer garden where you can enjoy local beer and traditional Bavarian fare. These are just a handful of Munich's many attractions. If you are staying in Munich THIS is the place to stay. The rooms are simply luxurious, truly 5 star. The beds are heaven and the service couldn't be better. It's a bit pricy but it's worth it. Lovely quiet area with good restaurants very nearby. Welcoming atmosphere. Room had everything one could want and was very clean. Talk about full service for a reasonable price!! This place is in the heart of the Alstadt. The service and the rooms are one-of-a-kind. Very impressed. Customer service was excellent. Rooms were beautifully presented and kept very clean. The location was quiet and it was still only a few minutes walk from the city centre. Buy a one day German Rail Länder Ticket and you could explore all the Christmas Markets in the state of Bayern for one amazing price of: One passenger: €23 Extra person: €5 Unlimited travel, one price, through out Bayern (see map above) for up to 5 people, 9 a.m. until 3 a.m. of the following day and on Saturday, Sunday and bank holidays from 0a.m. until 3 a.m. Valid on all local trains (Interregio-Express, Regional-Express, Regionalbahn, S-Bahn). Prices quoted are for 2017 ticket machine purchases only. 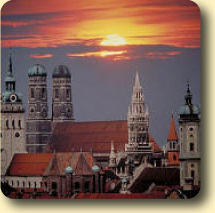 See all that Munich has to offer on a big loop hop-on, hop-off tour from an open top bus. 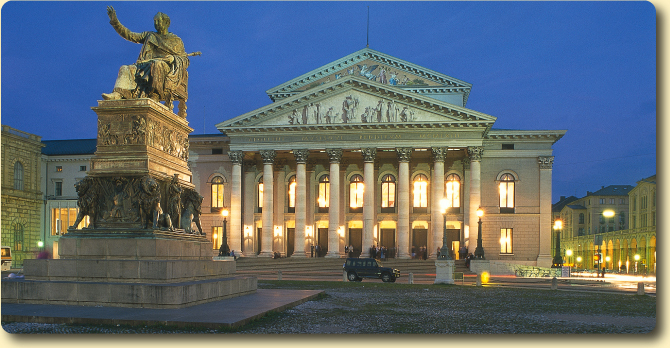 Travel to city centre sights such as the Hofbräuhaus and the Pinakotheken art museums. Or venture out to the Palace of Nymphenburg and the Olympic Park. Experience Linderhof and Neuschwanstein, the beautiful dream castles of King Ludwig II. 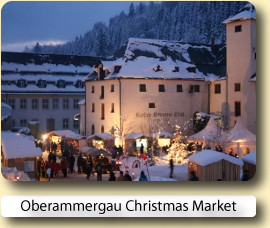 The tour also makes a stop in the charming town of Oberammergau for shopping. 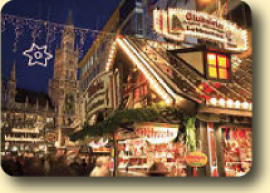 Book your hotel for the Munich Christmas Market with Expedia or Hotels.com.Both online reservation services will let you compare and book hotels at great low prices.